Come and “Beat the Bounds” with us! Pittville Youth Action Group (PYAG) – Our Shed! EARLIER today, this year’s A Level results were published with another record breaking number of passes and high grades. Inevitably the implications of the results were discussed on the Today Programme – after all they have to fill up the endless space and time which radio offers (!) – and rightly the focus was on the results in English and Maths. One question was why do so many students who are not too good at maths (including me, incidentally!) find the whole subject off-putting? Some find maths boring and others never quite get the hang of it. The reply of an outstanding mathematician was unexpected and particularly interesting. He explained that getting things right in maths is never as satisfying as it sounds. Much more interesting is what happens when a student gets things wrong. Then the whole subject opens up. Genuine curiosity is aroused together with a challenge to move ahead and make fresh discoveries. I happened to hear that discussion the day after reading a biography of a famous Anglican theologian – the 19th century Bishop of Durham, Brooke Foss Westcott. Westcott was a great teacher, one of the best linguists of his age and very well-informed about science and literature as well as theology. In one of his sermons he also said something well worth pondering: Christian Doctrine is designed to direct and sustain us in our efforts to hold a personal and living faith with a personal and living Lord. True doctrine is not an end in itself: it cannot carry us beyond the religion of the intellect; and religion belongs to the whole life, our will answering to the will of God. Westcott distrusted every kind of dogmatism, especially when applied to Christian faith. He was sure that ‘being sure’ or ‘being right’ is not what lies at the heart of the Christian life. Instead, what matters most is being in a living, dynamic relationship with Jesus, who constantly leads his disciples forward with an invitation to accept failures and make new beginnings over and over again. Putting those two things together helped me to see how destructive it can be to base a Christian life on dogma and propositions. Better to consider the mathematician’s fascinating suggestion. In discipleship, facing failure and regularly starting again is instructive and deepens understanding. Indeed, thinking we have got anything right usually places us further away from the truth. To put it at its simplest, Jesus’s love means he accepts and (continued overleaf) forgives us and provides the courage and companionship we need to start again. The various noisy critics of Christianity at the moment not only give in too often to their own brand of dogmatics (however many disclaimers they make) but they have also separated doctrine from experience, which is one reason why they may be respected but never feared. They are not actually facing the questions that matter. Happily, the BBC discussion about the A level results did not get stuck on the debate about standards. More imaginatively, it urged two much more fundamental values in education. A wise teacher said ‘a good student is constantly being stretched and is also regularly being stimulated to maintain the momentum of learning’. I find that another marvellous insight into what true discipleship means. When we really try to follow Jesus and learn his ways, we are constantly challenged and sustained to raise our game. So back to school! Still so much is waiting for us to discover afresh and we definitely have further to go. Are you YOUNG enough to drive? SHORTLY after I retired twenty years ago I was asked if I would like to drive my car for Prestbury Memorial Trust. This I did for a year, and then the Warden said come and try the minibus. So I became one of the Trust’s minibus drivers. I drove trips mainly to the supermarkets, but on one occasion to a pub at Twyning. The next step was that Fred Brockman asked me to drive for the Senior Citizen’s Club twice a month. Fred had been driving the bus for some years and thought it was time to retire. About five years ago the Memorial Trust Transport Manager, who had recently taken on this job, decided I had too much to do and arranged for me to drive only once a month for the Trust and twice a month for the Senior Citizens’ Club. The passengers are nearly all elderly ladies, with just a gent now and then. I enjoy doing it. The sting in the tale: Next June will be my 82nd birthday and will be the last time I can drive the Minibus. A volunteer is needed to replace me. It was with great sadness that we learnt that Bob Lyle died on 24th August. We extend our sympathy to Barbara, Anthea, Nigel, David and all the family. Bob’s funeral will take place on Tuesday 2nd September at 12 noon in St Mary’s Church, Prestbury. Bob was always very involved in events at church and in the village, as you can see from his article below about next year’s Passion Play. 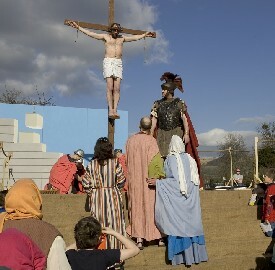 The Prestbury Passion Play will take place again on Good Friday, 10th April 2009. 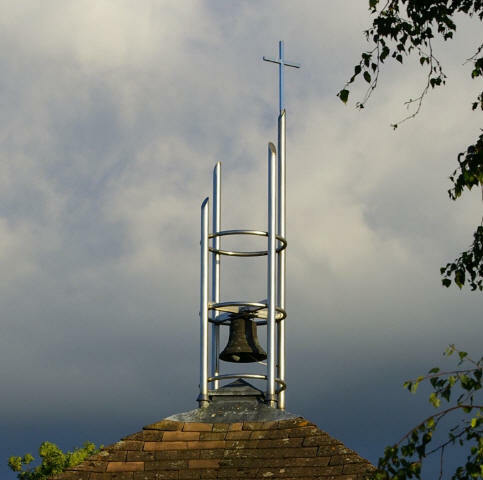 Originally inspired in 1985 by the then Vicar, Canon Ian Hazlewood, it has been performed six times and also at the Millennium by Cheltenham Churches Together through the streets of the town. The Play sets out to dramatise the powerful message of the Last Supper, the Betrayal, the Trial and the Crucifixion, but alongside the familiar story the production highlights the relevance in today’s world of show trials, military occupation and official injustice. The cast will be ecumenical, involving not only people from the North Cheltenham Team but also from the Roman Catholic and United Reformed Churches. There are many main characters: Jesus, the Twelve Apostles, the Elders, Barabbas, Pilate and the Roman Soldiers, but the Crowd also plays a vital role. The production will be directed by Daphne Philpot; co-producers are Cyril Beer and Bob Lyle, and we shall need a team of stage hands, costumiers, front of house etc. 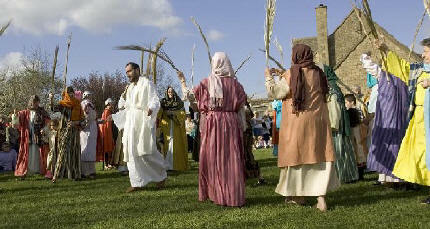 The Play will take place on Good Friday at 11am and 3pm on the Scout Field on the Burgage, Prestbury. Admission is free but a retiring collection will be made and given entirely to charity. The production will be launched on Wednesday 22nd October at 8pm at St Nicolas’ Church, Swindon Lane. If you are interested in taking part in any way – acting or backstage – do come along to this meeting. Anybody and everybody is invited. We shall read through the script, discuss preliminary plans and issue a rehearsal schedule. We went to church parade at Celebrate!. We met outside St Mary’s Church and sorted ourselves into order. We paraded into church behind Harrison who carried the flag. We all had jobs. My job was to read the prayer. We all made a very big friendship stick and talked about Beavers having fun and making friends. I loved it especially the parading. Jennifer, who worships mainly at All Saints’ but is known to many of you, will be moving to St Stephen’s House Theological College in Oxford towards the end of September. Here she will undertake a one-year full-time course to prepare her for ordination to the Diaconate in June 2009. Jennifer will then work with us in our Team Ministry on a non-stipendiary (unpaid) basis. We send Jennifer our prayers and best wishes as she embarks on this exciting new chapter of her life. Following Peter Greaves’ move south we are now in the position of not having a permanent organist or choir master at either St Nicolas’ or St Mary’s. At its meeting in July, the PCC set up a working party to meet to discuss this situation and to consider its implications and a possible way forward. A group met in August and included Fr Michael, Fr Daniel, two representatives from each choir and one Churchwarden from each church. The group reflected on some feed-back from St Nicolas’ choir and from the representatives of the St Mary’s choir. It then discussed the ‘ideal’ solution as well as some of the options which could be used as interim measures. The group also put together a list of attributes for a Director of Music which it acknowledged would be suitable for a post-holder in either of our churches. The group concluded that, in view of the difficulty of making an appointment, it might be necessary to place a more general advertisement setting out the current position in the parish and inviting people to express an interest and to talk with us about what they could offer. This will be reported back to the PCC and to both choirs. It might not be easy to fill either of the vacant posts and we may have to continue to rely on the organists who have given us their support and time on a temporary basis. Please keep the whole question of music in our worship in your prayers as we seek a satisfactory solution. Any one of you who is ill should send for the elders of the church, and they must anoint the sick person with oil in the name of the Lord and pray over him. The prayer of faith will save the sick person and the Lord will raise him up again; and if he has committed any sins, he will be forgiven. On Sunday 14th September we will be holding a team wide healing service in All Saints’ at 6.30pm. This will be an opportunity for all of us to receive Christ’s gifts of healing and forgiveness as outlined in St James’s letter above. Our liturgy will give each one of us the opportunity to be reconciled with God, and to commend ourselves to the healing power of His Cross. (The Church celebrates Holy Cross Day on 14th September.) The liturgy that we will use has two distinct parts. In the first section there will be hymns, readings, prayers, and an address, as well as an opportunity for us all to stand prayerfully at the foot of the Cross. In the second part, there is an opportunity for private prayer, anointing, and laying on of hands for any who wish to make use of these ministries. The prayer and laying on of hands will be carried out by people, both lay and ordained, who have been chosen and authorised for this particular ministry. So please do come along to this evening service. Bring your needs, and the needs of others you know, trusting in the mercy and goodness of God. Come and experience the healing power of the Cross, given freely to all who ask. For surely this is a wonderful gift, and worth having. 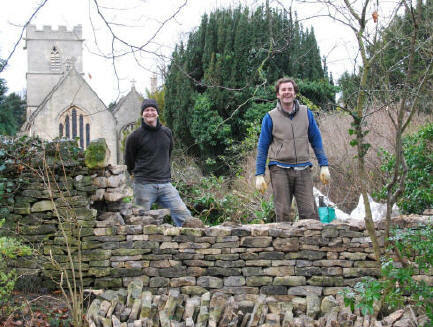 The wall must have been built in the 1920s when the owners of Cleeve Corner sold a second strip of land to the church as an extension to the churchyard. The first strip had been sold for the same purpose in the 1870s and this started from level with the King’s Arms alleyway. Apparently 80 to 100 years is a good life for a dry stone wall in a built-up area, which means that our churchyard wall has lasted reasonably well. The architect had estimated that five yards of wall would need to be taken down and rebuilt. However in the event it turned out to be eleven yards in three separate sections and it now looks very smart again. The work was undertaken by David Kenyon. In 2007 Prestbury and Pittville Youth were given a grant of £5,000 towards their work with local young people by the Church and Community Fund. This is a centrally run grant-making fund which supports the Church of England mission in the whole community. The application for funding was made at around the time that Bishop Michael visited St Nicolas’ Church to commission the Youth Work Team and to licence Andy Macauly as a Youth Minister. After the service, when asked, the Bishop agreed to provide a reference in support of the application, which he did by sending his comments direct to the Fund offices. Tricia Wilson, Hon. Sec of PPY, tricia.wilson ppy.org.uk. As you will be aware Prestbury & Pittville Youth work in partnership with Pittville School to provide an alternative curriculum project (PYAG) two days a week for 14-16 year olds. The PYAG students get involved in many community action style projects and skills based opportunities, and therefore have a number of tools. I would like to thank a number of our congregation for their participation and support in helping the lads on the Project to erect the new shed to store our equipment. The lads really engaged with this activity and we are very grateful for the support that Mike, Nigel, Henry, Peter, and Chris gave. Thank you! 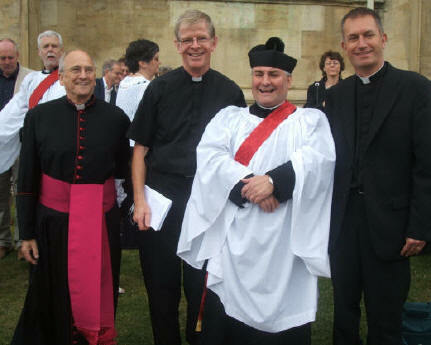 ON SUNDAY 29th June Fr David Gardiner and Fr Andrew Hughes were ordained deacon in Gloucester cathedral. Fr Andrew is non-stipendiary, working in the Team part-time until December, when he will move to Lichfield Diocese to take up a full-time post in the parish of Friar Park, Wednesbury in the West Midlands. Fr David is a stipendiary curate and will be working full-time throughout the Team for the next three years. 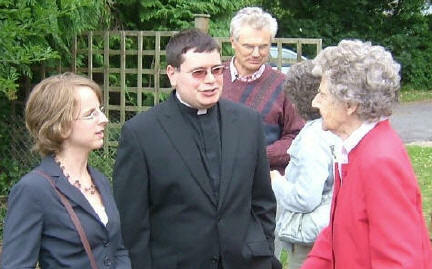 IN THE afternoon there was a tea party at Prestbury Vicarage to welcome the two deacons and their friends and families. 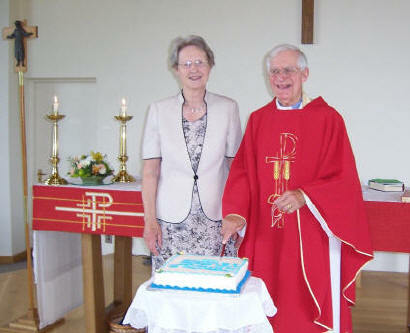 ALSO on 29th June Fr John Gann celebrated the fiftieth anniversary of his ordination to the priesthood. He presided and preached at St Nicolas’ that morning. A WEEK later, 6th July, was Fr David’s first Sunday as deacon in our parish. His first duty was to reaffirm before the parishioners the Oath he had made to the bishop at his ordination. Our preacher that morning was Bruce Goodwin, who had been visiting the parish for the previous four weeks on placement as part of his training for ordination. I HAD OFTEN listened with a degree of envy to my children’s tales of their travelling exploits since at the same age I had neither the confidence nor the money to indulge in this kind of venture. I was 54 years old and on my own so when the decision of where I should go and what I should do on my holiday this year came up on a gloomy Sunday afternoon in February I had the inspiration that I too would don a rucksack and go travelling! Why should young people have all the fun? Never one to let the grass grow under my feet, I decided on Scandinavia since it seemed relatively safe and they spoke English, didn’t they? (Later I discovered that they don’t speak it willingly in Finland!) So I booked my flights there and then on the Internet – outward to Copenhagen and returning from Helsinki. It wasn’t too long later when the reality of my rashness dawned. I had never even stayed in a hostel in this country and I had only ever carried a day rucksack and not a 60 litre one! I had never visited any of the places that I was going to either. It was made even worse by people telling me how ‘brave’ I was! This was definitely a time to put my faith in God. Well, how did I fare? There were down times such as when my room booking in Copenhagen for a bed in a four-bed female dorm turned out to be me and nine young men in a 10-bedded dorm! I had to use my assertiveness skills to negotiate another room with reception staff who clearly felt I was being unduly picky! Overall though I had a marvellous time and two weeks of unbroken sunshine definitely helped! You chat to other people in hostels in a way that you don’t do in hotels, so consequently I chatted to a German woman about our shared experiences of the Alpha course and with a couple from Blackpool, staying in the same hostel in Stockholm, about ‘the Archers’! Plus I experienced wonderful sights, such as when I sailed through the Stockholm archipelago en route to Finland as the sun set at about 11pm. It was just so beautiful. I visited Hamlet’s castle at Helsingor and experienced my first ever sleeper train in Sweden although I drew the short straw and got the very top bunk! I met my Finnish penfriend for the first time in 14 years of writing and shared the novel(!?) experience of a Finnish lakeside sauna with her and her friends!!! Of course I visited lots of churches and had my perceptions challenged. I had always thought of Lutheran churches as plain and functional but the Domkirke in Roskilde in Denmark had retained its beautiful medieval wall paintings and Storykran in Stockholm has a huge, painted, fifteenth century St George and the Dragon statue. I did find the Swedish tradition of leaving the tin coffins of the royals and wealthy just lying around on the floors of their chapels a bit unsettling especially the tiny coffins of young children. The minister at the small thirteenth century church in Sysma in Finland explained to me how people used to travel for a day across Lake Pajanne just to attend the service there. Finally, in Helsinki I visited both the Lutheran Cathedral and the Orthodox Uspenski Cathedral. The latter was a mass of gold and jewels. Yet in all of these churches – simple and ornate – it was easy to feel the presence of God. Would I do it again? Well, yes probably, but it does take quite a bit of planning and organisation but you do meet some interesting people and see the places that you want to see and not what the tour company selects. Was I brave? No I wasn’t – just a bit foolhardy at times! I RECENTLY went on a cruise to Greenland. Disappointingly, the drift ice did not seem to have heard about global warming and was unexpectedly dense, preventing the ship from entering the southern fjords, where we had been promised a visit to several ruins from the Norse ‘eastern settlement’, including the scanty remains of the cathedral at Garðar. This disruption of our schedule did however give us a full Friday’s shopping in the capital, Nuuk (or Godthåb in Danish), where the shops would have shut on a Saturday afternoon. There was a blizzard in the morning, but by the late afternoon it had melted. I was impressed at how well the storm drains coped. Nuuk museum has some famous freeze-dried mummies and an interesting bookstall. There was another good bookshop nearer the town centre. Near the museum is the little old (1849) church of Our Saviour, now raised to cathedral rank, because starting in 1994 bishops have again been appointed for Greenland for the first time since the Norse colony vanished in the 15th century. A statue of Hans Egede, the first missionary (1728) to Greenland, is on a mound nearby. There is also a large new church in the centre, the Hans Egede (memorial) church. It is said to be dull but we did not have time to check up on this. On Sunday 1st June our ship put in at Sisimiut, the second city of Greenland. Sisimiut, called Holsteinsborg in Danish, lies slightly north of the Arctic Circle. It happened to be confirmation Sunday in Sisimiut. Normally a locally resident trained lay person called a ‘catechist’ conducts a Greenlandic church service, but for confirmation a priest comes – not as in England the bishop. The catechist wore bands, the priest wore not a dog-collar but the ruff typical of Danish priests. For the communion the priest wore a green chasuble-like vestment; I did not note down at what stage in the service she put this on. The service had already started when a dozen or so of us tourists entered and sat at the back, below the gallery. We did not hear either a sermon or bible readings. Presumably these had been in Greenlandic, a language unrelated to those of Europe. There were few or no congregational responses but frequent short hymns. These used tunes familiar also in England and since Greenlandic is written phonetically, when I eventually found a hymn book I was able to join in for the last one and a half hymns, albeit without understanding. A handful of words like ‘Christ’, ‘God’, ‘Jesus’ and ‘Amen’, taken from Greek, Danish or Hebrew, are recognisably similar to the English, but apart from that I only spotted some part of the word for ‘death’. The confirmation candidates were initially sitting on chairs at the end of the pews, the girls on the left side of the aisle and the boys on the right. All wore national costume. A sprinkling of the rest of the congregation of all ages also wore national costume. For women this is long white boots, tucking in to leather shorts and beaded tops; for men white anoraks and slightly decorated boots. Most, however, dressed in the range of ways we do in Prestbury, albeit with a slight tendency towards boots. All the candidates went up to the altar rails for their collective and individual responses. As each individual was confirmed, a section of the congregation stood. 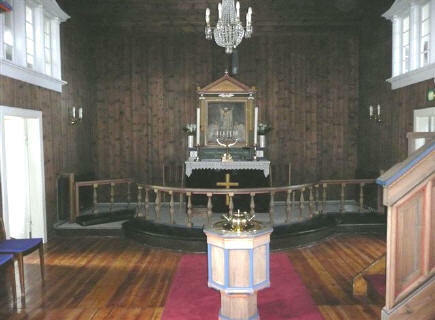 The service continued, in Greenlandic, with the celebration of communion. A handful of us tourists joined the last row of the regular congregation in taking communion. The mechanics of giving communion was slightly different from both St Mary’s and the URC. The congregation went to the altar rails as here. The bread was a small round wafer as used in many English churches, but the wine had been consecrated (and was reconsecrated) in a large flagon such as we see here only in museums of church plate. It was poured by the priest into individual cups which were then handed to the communicants. On leaving the altar rails, they put the cups on a tray beside the font (the font was just below the altar rails) and the tray was collected and taken out of sight for the cups to be cleaned. Spotting that we were visitors, the priest said, ‘the body of Christ’ and ‘the blood of Christ’ in Danish, the second language of Greenland. But she must have doubted if I were even a Dane, for I think she wished me ‘Guten Tag’ in German as I left the church! Many members of the congregation, small children and adults, left and reentered. The children were I think simply restless. Perhaps the adults wanted a smoke? After the service family groups took photographs outside the church. 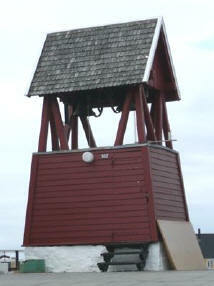 Most churches had only a single bell, often on the corner of a nearby building, but in Qeqertarsuaq (Godhavn) on Disko island we saw a detached bell tower with two bells. The church itself was basically octagonal and is apparently known locally as God’s Inkpot. The church itself looked closed and we did not have time to investigate. Jesus went up the mountain and called to him those whom he wanted, and they came to him. And he appointed twelve, whom he also named apostles, to be with him, and to be sent out to proclaim the message. They were a motley crew, these apostles, some figuring quite prominently in the Gospel narratives, others hardly mentioned at all. We know quite a lot about one or two of them, hardly anything about the others. Most were uneducated – they might have had a bit of a battle with the Selection Panel if they had been offering themselves for ministry today! Andrew brought his brother to Jesus. The Diocese would have been proud of his spirit of mission! He also encouraged a young boy to offer that lunch of loaves and fish which fed five thousand people. But his brother, Simon Peter, seems to have been blessed with the knack of speaking out of turn and putting his foot in it. Some of the disciples, like James and John, the sons of Zebedee, went on to become important figures in the Early Church; others we remember because of who they weren’t – James son of Alpheus, who was not the James who led the Jerusalem Church. The people we remember most easily are the ones who got it wrong! Think of Peter’s despair and humiliation when Jesus looked at him across the courtyard on the night before he died, or Judas Iscariot, trying to force Jesus’ hand into proclaiming his power, but instead ending up on the end of a rope, victim of his own guilt and disillusionment. We can all sympathise with Thomas – traditionally the doubter – ‘Unless I see, I will not believe!’ His experience rings true on those days when things are not going well and we might be tempted to wonder if God really is in charge. Thaddeaus is one we get muddled about because the list of Apostles is not identical across all four Gospels. He is also known as Jude or Lebbaus. And who was Philip? Here we have another missioner, whom we find in the Acts of the Apostles proclaiming the Good News to an Ethiopian nobleman, but after baptising him in the next convenient river, he was mysteriously teleported to another location. Matthew was a tax collector, even less popular than a traffic warden. You can picture the disapproval on the faces of the Jewish elders! And what about Simon the Zealot? Surely Jesus would not have selected a terrorist? Or Bartholomew? Who on earth was he? Twelve men, each of whom brought to the group his own strengths and weaknesses. What can we learn from a list like this? Each one knew that he had been personally called by Jesus himself, and we are reminded that every individual is called by Christ to play his or her own unique part in bringing in the Kingdom. Some will hit the headlines, for good or for bad; most will simply beaver away quietly in the background. Everyone has something to contribute. Just as Christ calls and values each one of us, so we must recognise his mark in the people we meet, revealing his love and caring about them all. Let us thank God every day for the wonderful diversity of the people around us and ask him to help us recognise the gifts he has given to them, so that they can be encouraged to use them in his service, wherever they may be. The first Celebrate! of the new term was on 31st August. This is a short, family-orientated service, with songs, stories and activities. If you would like to get involved please let Fr Daniel know (contact details inside the front cover of this magazine). Celebrate! takes place every Sunday at 9.30am at St Mary’s Church, Mill Street, Prestbury. Don’t be late – it only lasts three quarters of an hour! This short informal service for pre-school children and their parents/carers starts again on Thursday 4th September in St Mary’s church. Do come and join us for action songs and a bible story, creative activity, toys and the opportunity to chat over a cup of tea. We start at 2pm and finish in good time to meet older children from the Prestbury schools. Please join CHADS at 7pm for our Patronal Festival Drama, followed by Cheese and Wine, at the Prestbury Hall in Bouncers Lane. Tickets are available now at £5 per head and all proceeds will go to the charity Let The Children Live!. All three of the current team churches have members appearing, in one form or another, and we hope that we will both entertain and amuse a large audience. Please come along and bring your friends and family for a fun packed, light-hearted evening. Please note: there will be NO 9.30am service at St Nicolas’ and NO 10.30am service at All Saints’ this morning. Beginning on Tuesday 9th September, a new Bible Study Group will be starting up in the North Cheltenham Team. In the past Bible Studies have tended to happen in the evenings, which for many people makes them difficult to get to. This Group will therefore meet weekly on Tuesday mornings in St Mary’s, Prestbury. All are welcome, of any age, at any time: there is no need to commit yourself to coming every Tuesday forever! The group will be led by Fr David, but this is not an extended sermon slot: it is a time for us to come together to read the scriptures and discuss them. I expect to learn as much from you as you learn from each other, and a great deal more than you learn from me. This is also not going to be one of those groups where each week we trawl through another entire chapter of a book of the Bible: initially we will study in more depth whichever reading from the previous Sunday struck us most. The format will be open and relaxed, and will not require an in-depth knowledge of Biblical socio-political history. Instead we will be searching together for a greater knowledge and understanding of the scriptures, prayerfully considering how they touch our lives. If you are interested and would like to know more, contact Fr David or simply come along to the first or any subsequent session at St Mary’s Church, weekly on Tuesdays in September at 11am. The fete will be officially opened by Mr and Mrs Tom Graveney, whom many of you will know, not only as former landlords of The Royal Oak, but also for Tom’s cricketing career. We have a large collection of stalls and sideshows and items for the following stalls can be collected: Toys, Books, Produce, White Elephant, Cakes, DVDs, Videos, Tapes; in fact anything you wish to donate. If you have a gazebo that we could borrow – not to protect us from the rain you understand, but to act as a sunshade from the sunny day that we are anticipating – please let me know. 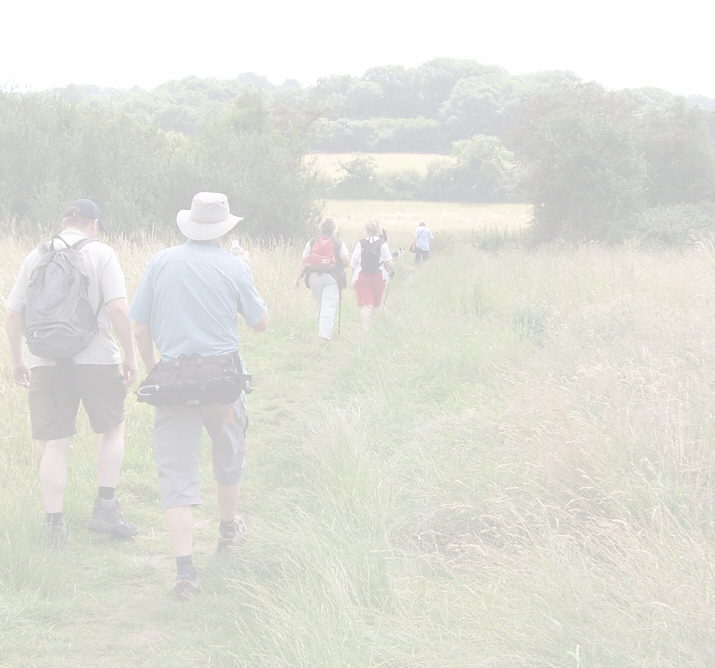 Please support this venture as it brings valuable income to the churches – bring your friends and neighbours as well – they might see that we are ordinary people – not a strange sect that only go to church. Sunday 21st September is the date for our next bakestall with contributions from the N-Z team and proceeds to Children in Distress. In July we sent £30 to MAF (Mission Aviation Fellowship). Thank you all for your support, both baking and buying. If you are unable to join the daytime bible study group, you could try the evening group in All Saint’s church at 7pm on the second and fourth Tuesdays of the month, starting on Tuesday 23rd September, for a five-part series on the Book of Revelation led by Fr Andrew. All are welcome even if you have not been before, and you are also welcome to stay afterwards for a short service of Compline or Mass at 8pm. Our September meeting will be on Tuesday 23rd September at St Mary’s at 7.30pm. Caroline Sexton will talk about the work of The Bible Society. All are welcome. Shirley Brown or Linda Dove. About a dozen Church members will be taking part in the Alpha course this autumn, but don’t worry if this is the first you’ve heard of it! The aim is to give some people an experience of the course so that we can offer it to people who have little or no experience of Christian faith. In the New Year we hope to launch Alpha properly, and then there will be a lot more publicity and opportunities to get involved. In the meantime, however, why not set aside some time to pray for those who will lead Alpha next year, and to ask God what he might be calling you to take part in? The vagaries of the English midsummer weather are now long forgotten, but the many visitors to the Prestbury Open Gardens weekend proved resistant and came in large numbers. As they wandered the village, maps in hand, they chatted together, comparing notes on gardens already seen and yet to be enjoyed. Cream teas in St Mary’s, served by a heroic band of helpers, were extremely popular. The weekend’s total proceeds amounted to almost £2800, a welcome boost to church funds. On behalf of Julia and Martyn, Dave and Pam would like to take this opportunity of thanking the many people who were involved with their daughter’s Wedding at St Mary’s on 26th July and for all the good wishes we received. Thank you all so much for helping to make the day so special and one that we shall all treasure.